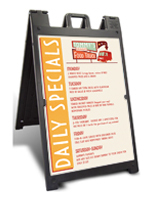 Signicade® Deluxe a-frames will generate new business when placed outside any storefront or restaurant! The sign boards have graphic frames on each side of the unit. This characteristic allows users to capture potential customer attention from every direction. 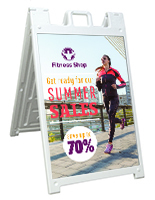 Graphics are not included, making these sign boards ideal for print shops or buyers that have their own graphic inserts already. 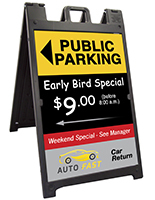 With these message boards, no screws, tape or hook-and-loop fabric are needed to attach your custom signage! 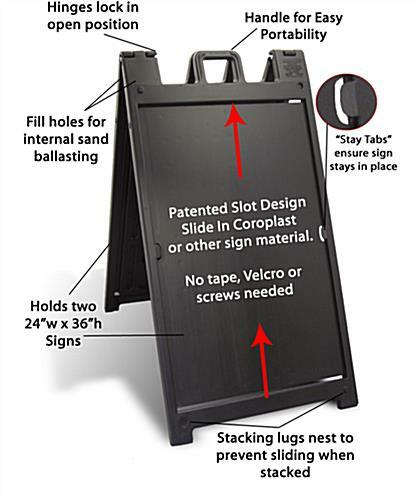 Instead, these sign boards feature a slide-in sign channel for inserting graphics easily. See the graphics below to illuminate the insertion process. 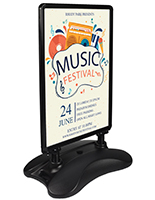 Plastic tabs on the side of the sign boards ensure that the posters will stay in place. Users will not need to run to the hardware store to assemble their advertisements. 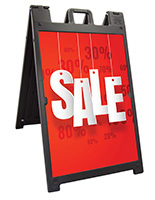 Deluxe message boards, sign boards are extremely durable and attractive. The alluring design is matched by the enticingly low price. 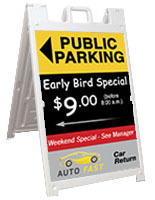 Sign boards, including a-frame signs and message boards, may be displayed indoors or outdoors, depending on your personal preference. 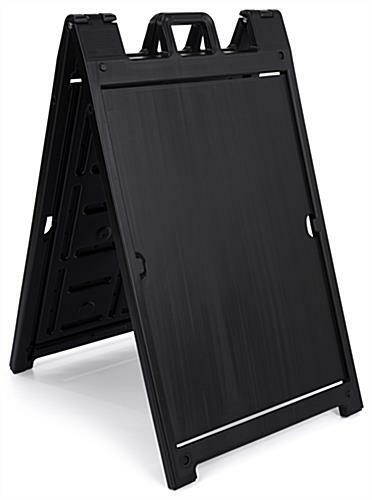 The durable plastic material makes the unit great in many different environments. The sign boards feature two sand holes, one on each side of the display. The holes allow the signage to be filled with up to 10lbs of sand for stability. The sign boards will stand up time after time. 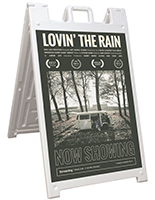 Special Note: We are one of the only vendors who sells this product packaged (1) frame to a very protected, re-shippable carton. You do not receive just plastic frames stacked on pallets, un-boxed and marked up. The frames are neatly boxed. While our pricing may be slightly higher than similar units, each frame is delivered in a durable, 275lbs. test, double-wall carton that allows you to transfer the product with ease. Please Note: This outdoor signage is the sign frame only. It does not come with any board, coroplast, or lenses. This "raw" unit is ideally suited for print shops or companies that have the ability to make their own signs on coroplast. 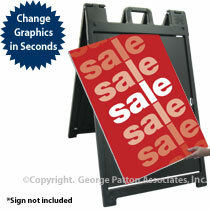 27.0" x 46.4" x 37.0"
This works great for our property and is easy to move. With sand loaded in it is also nice and wind-proof. Thanks for the great review, Hilary! This sign is really just what we were hoping it would be. It is exactly to the specifications promised, even including how thick the tabs are. We used a separate vendor for the signs themselves and have a very attractive sign now! It is also fillable with sand or kitty litter, which could be helpful for windy days and as a theft deterrent. Thanks for an excellent product. Thanks for sharing the photo and review, Zachary! Your sign looks great!